This year, the Harper College–one book, one Harper focus will be on Veterans. They have selected five texts that they believe will be of interest to a diverse range of Harper students, faculty, and staff. I am so excited to be selected for this program. 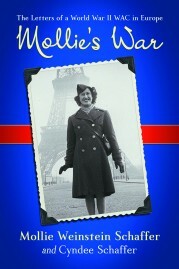 I will be presenting “The Journey to Mollie’s War: WACS and WWII” at Harper College on Monday, April 17th at 1 PM.